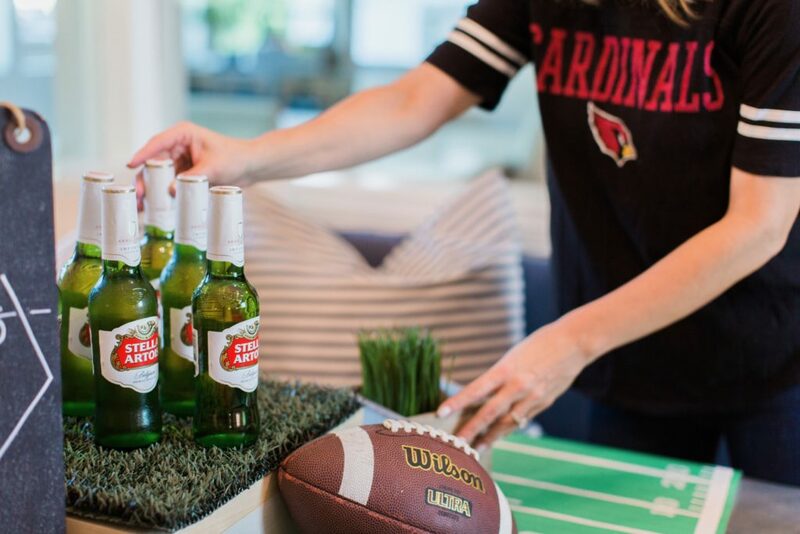 Throw an Easy Super Bowl Party: Here's How! 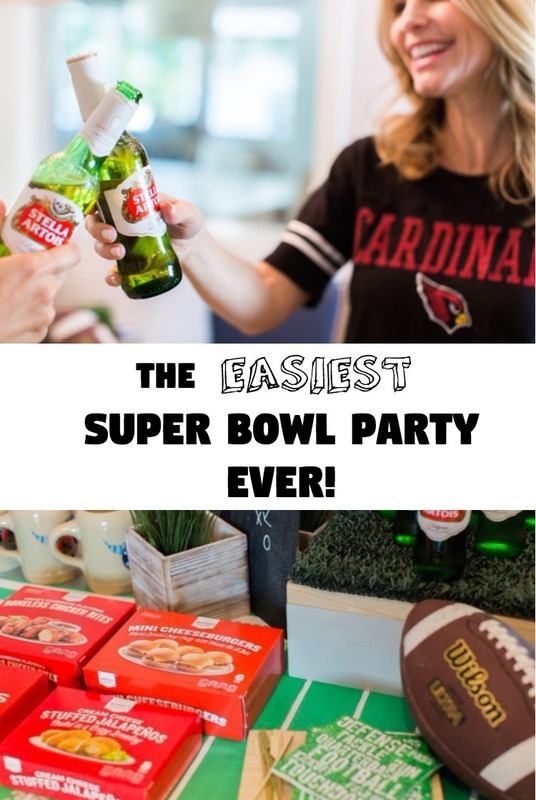 The Easiest Super Bowl Party You’ll Ever Throw! For as long as I can remember, I’ve looked forward to Sunday nights and watching football with my dad. When I was six, he bought me a set of #2 pencils with all of the NFL teams on them, and would quiz me on a regular basis. So, when my son turned six, I bought him a case of those tiny plastic NFL helmets and quizzed him too. Like father, like daughter. As such, my affection for football began at a very early age. 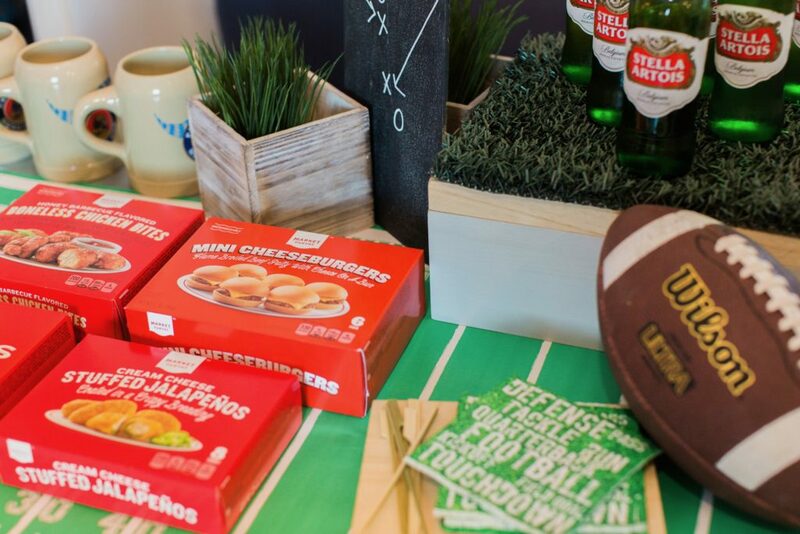 And a love of football + a love of entertaining = one great party! 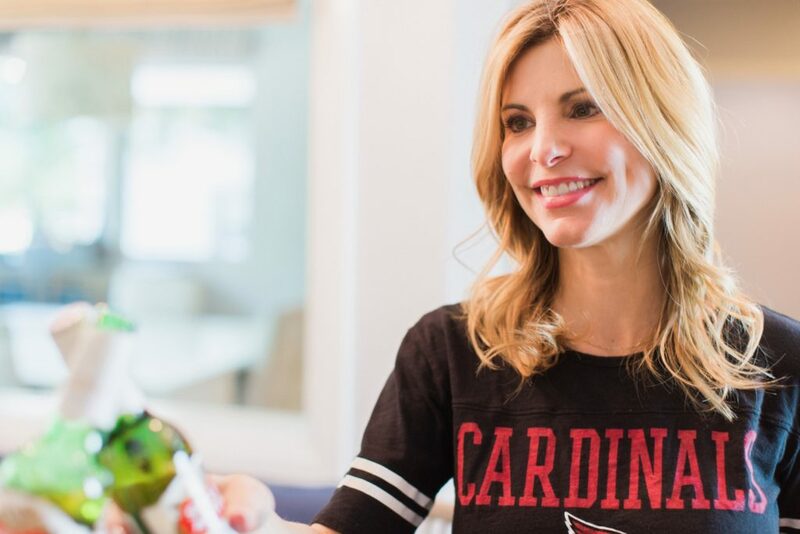 Here, I’m going to show you how to throw the easiest Super Bowl party ever so you can enjoy the game and watch the commercials too! 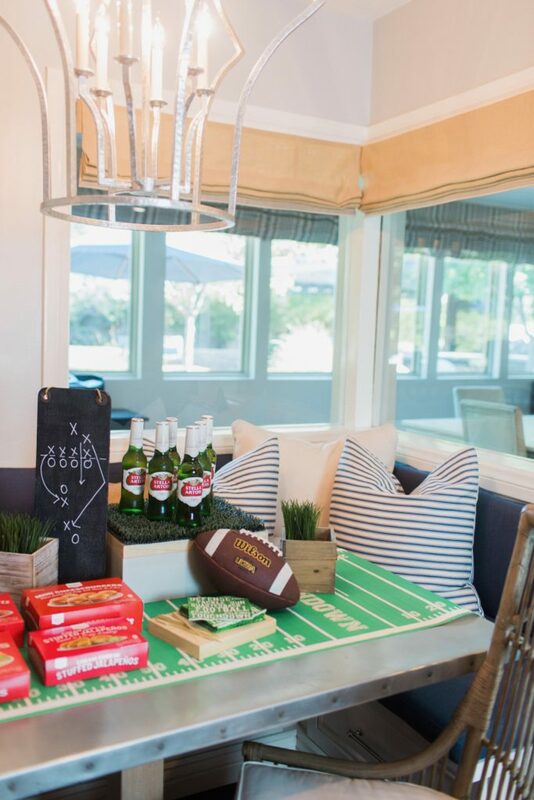 Keep the food and decor simple so you can enjoy your Super Bowl party too! Find a central location to set up your food table — preferably not in front of the TV. Everyone will stand in the way of those actually watching, so best not to start a fight. I chose my kitchen table, which has banquette seating on two sides if someone wants to sit, but offers easy access for those who are grabbing and going. A kitchen island would also work well. Simplicity is the key here, so don’t go too overboard with your decor. I found this cute football paper table runner and grabbed a couple of my son’s footballs to scatter around the table. No plates at this party — it’s finger food, so paper napkins work just fine. The grass doormat was my from local hardware store and I cut it to fit on top of a wine box that I used to create height. Green Stella beer fit into the color scheme perfectly, so several bottles were placed on the grass mat. 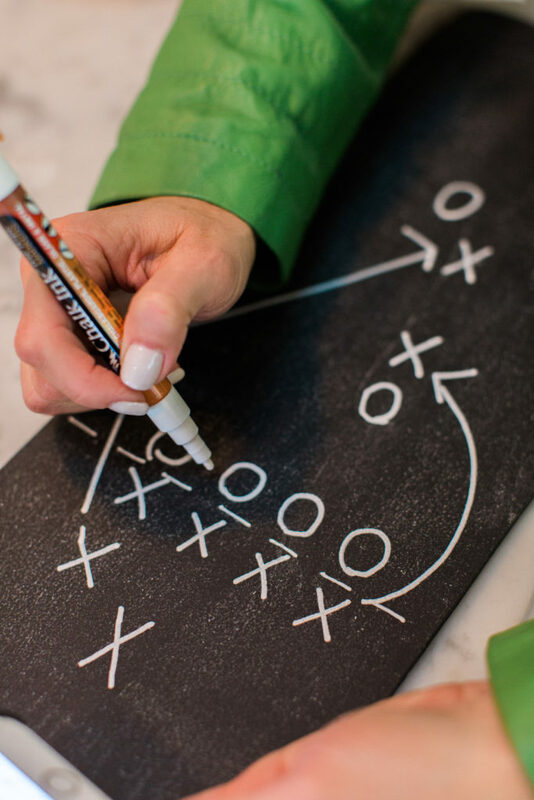 This chalkboard has been used as a menu board, a welcoming sign, and now a play board. Here is something similar. Ok, I promised you easy — here’s where hosting this party is beyond simple: my entire food menu is from the frozen section at Target! No joke. Target’s Market Pantry line has the BEST selection of apps and little bites. I have used them for a ton of parties and always get rave reviews. To mix in some flare, I like to add some interesting dips and sauces like raspberry chipotle sauce for the wings, pomegranate guacamole for the stuffed jalapenos, caramelized onion ketchup for the sliders, etc. Coarsely mash the avocados, making sure not to make them mushy. Add onions, jalapeño and lime juice. Fold in pomegranate seeds, cilantro and season with salt. Cheers to your favorite team! Raise your glass (and #2 pencil) high!